Paris evokes a feeling of wonder. 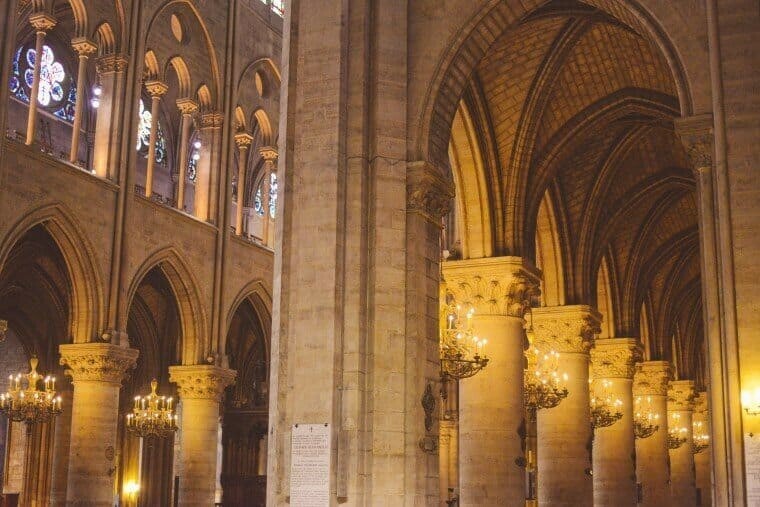 Avenues exude French character; monuments portray elegance with gothic architecture, not to mention the Parisian rooftops, cafes and gardens. Photographing Paris is definitely a journey through time and you’ll want to visit famous icons and unique locations to secure the best view possible of this incredible city. 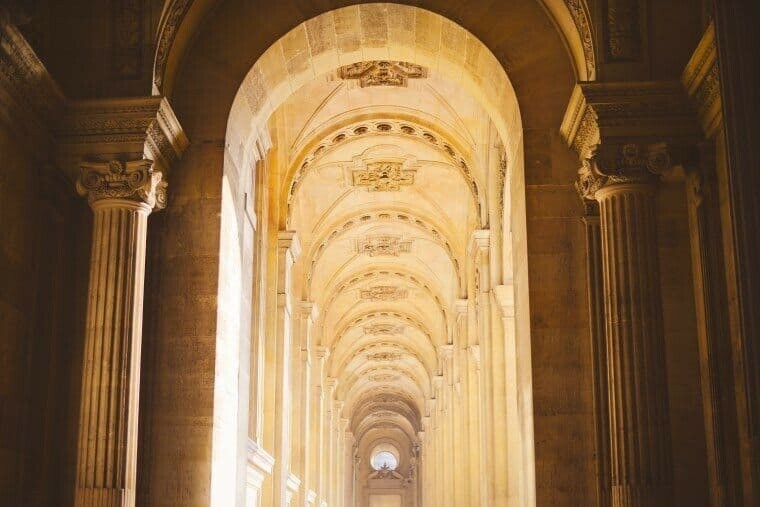 What started out as my top five locations soon developed into more of a guide to the incredible sights and hidden gems you can photograph around the French capital. It’s definitely too hard to narrow this list down any further so be sure to give yourself a few days to explore all that this beautiful city has to offer. Below you will find a list of the best photography locations in Paris alongside a collection of images I’ve personally taken at each one. First up though is a handy dandy map linking all of these spots together for when you visit next! 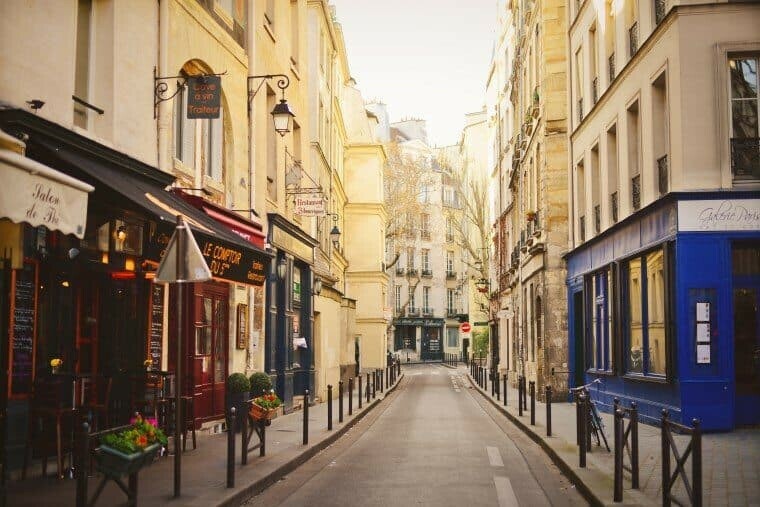 A walking map of the most accessible photo locations in Paris…one of the best things you can do in Paris is to simply wander on foot throughout the city. You’ll find your own corners of Parisian gems and while you’ll no doubt end up with sore feet, you’ll have amazing photos as well! For the other locations noted below it’s best to check the metro map for easy access. 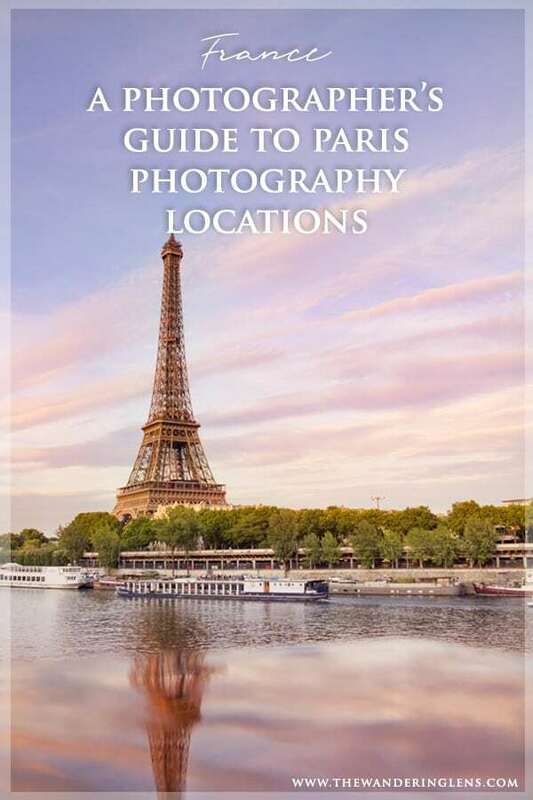 ** Paris Photography Location Map: Scroll to the bottom of this guide for a Google Map with a suggested walking route + all Paris photography locations mapped out for your next visit to this gorgeous city. 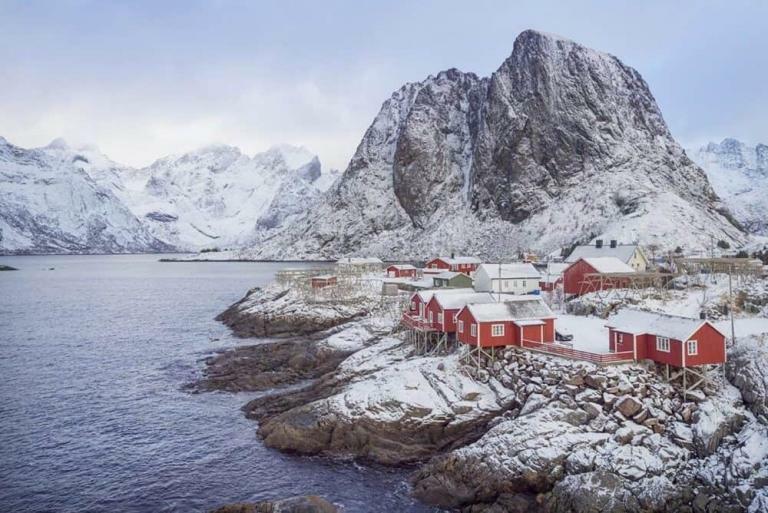 There’s also a handy little section with links to other photogenic regions in France! Overlooking the entire city, the Basilique du Sacré-Coeur offers what is in my opinion, the best view in Paris. Few people realise you can access the top of the dome so at sunset you’ll be sharing with only a handful of visitors who dared to take on the 300 stair climb. 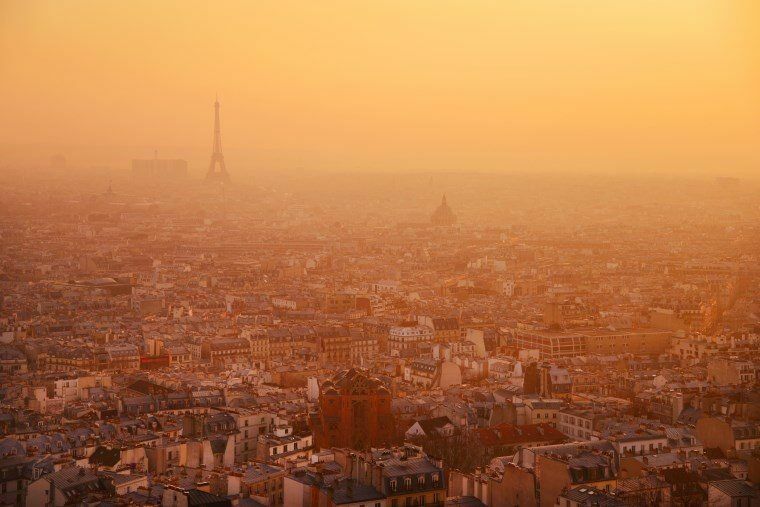 The peak of the dome has a narrow walkway that gives you 360degree views, an incredible scene to witness as the sun sets over Paris. Be sure to check closing times before you start the climb as they vary from month to month and sometimes even day to day. The path around the dome with lots of photo windows to see and capture the city from. For quaint cobbled streets lined with cafes and restaurants that ooze charm, this is the place to wander. You’ll find this area just over the river to the south of Notre Dame. 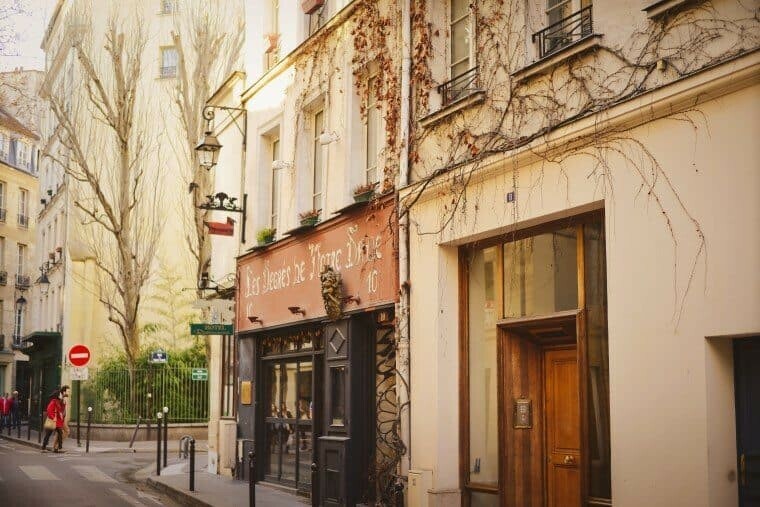 Roam along Rue de la Bûcherie and Rue Saint- Séverin for photographs of traditional Crêperies and street scenes. 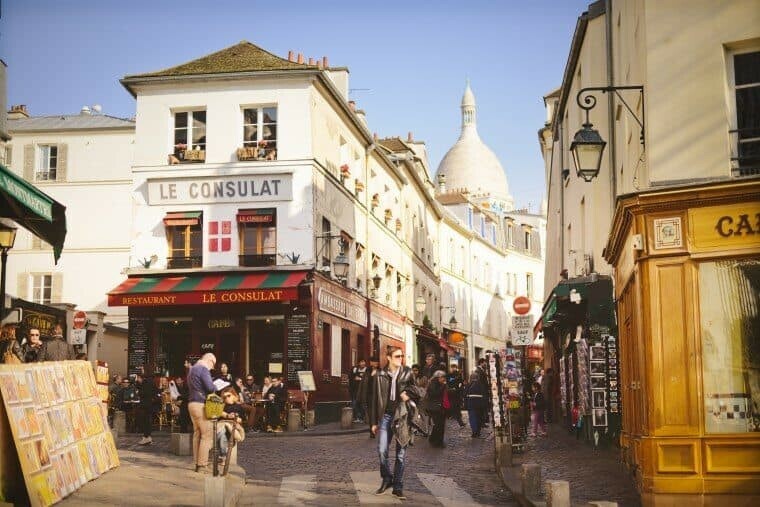 Home to resident creatives and street artists, Montemartre is the epitome of French character. 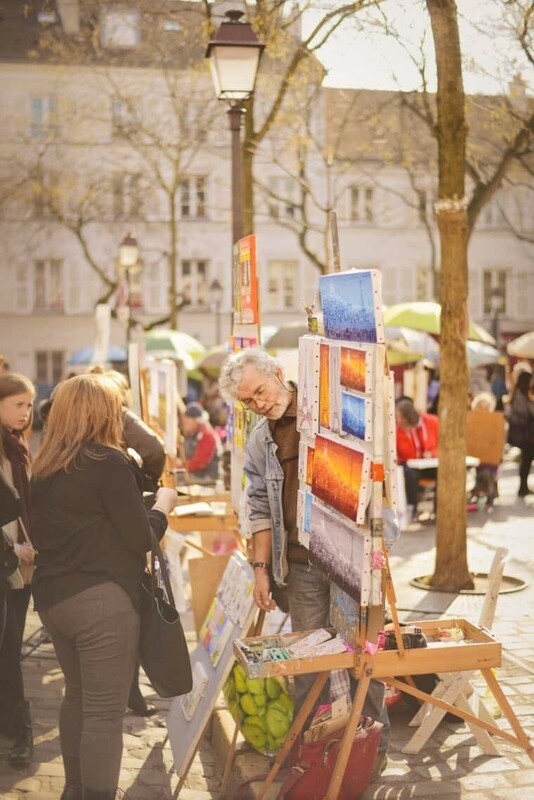 At first glance it might seem like a tourist frenzy but if you venture away from the Place du Tertre (artist square) you’ll find a village like atmosphere with a unique ambience unlike anywhere else in Paris. 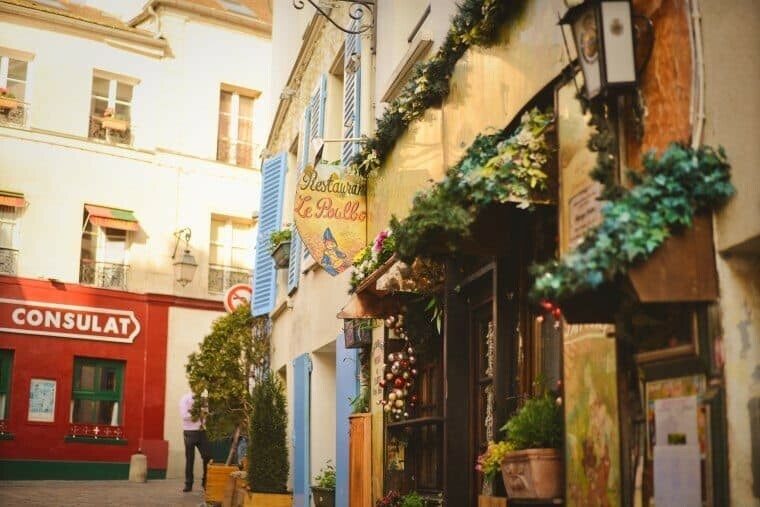 Have a peek at the cute pink restaurant ‘La Maison Rose’ and the draping vines along Abreuvoir Street then head down to the windmill of Moulin de la Galette on the corner of Rue Lepic and Rue Girardon. 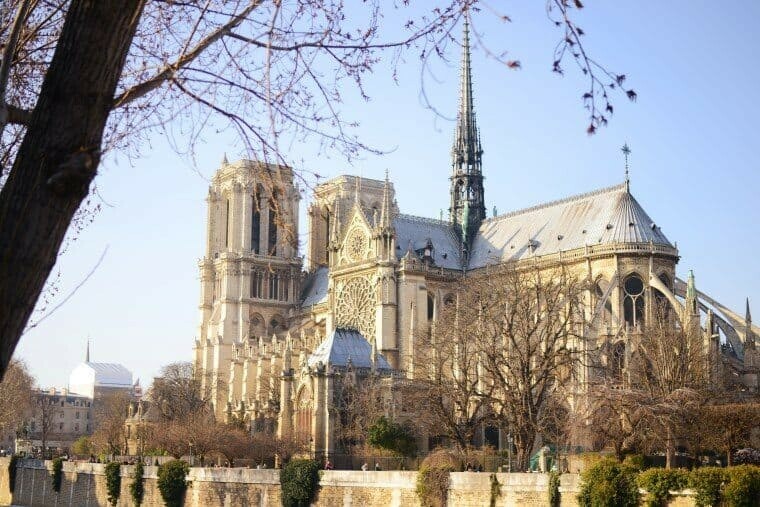 One of the finest examples of French Gothic architecture, Notre Dame is an essential photo stop in Paris. 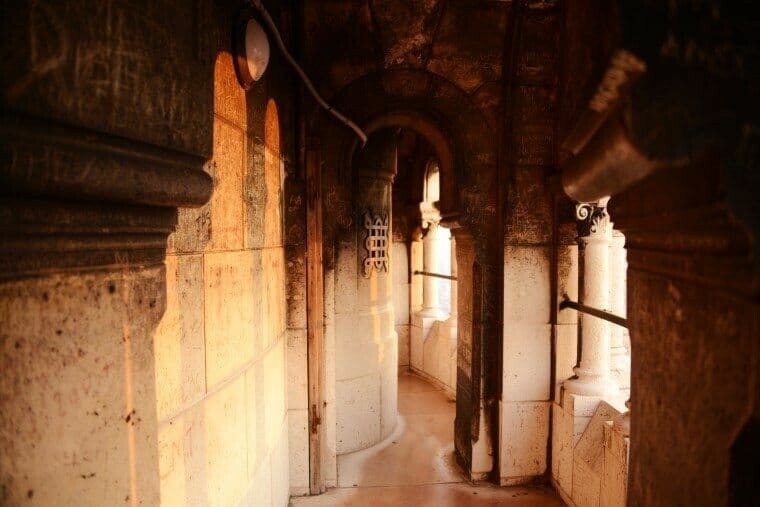 The interior is dimly lit offering shadowed arches, intricate detailing and patterned flooring. If you arrive early enough in the day (before 10am) you’ll avoid lengthy queues to climb to the top of the cathedral…an absolute must for a fabulous view! 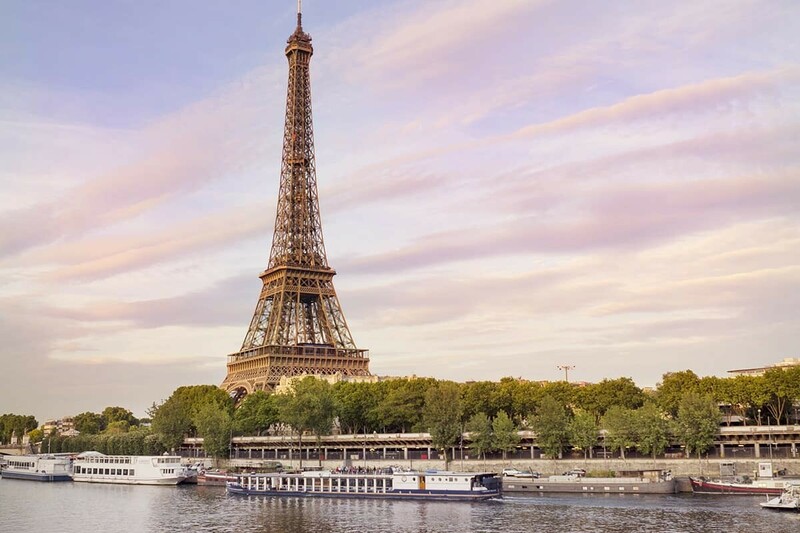 Climbing the narrow staircase to the top is an experience in itself then once you arrive to the open air walkway circling the tower you’ll be greeted with views along the Seine River all the way to the Eiffel Tower. 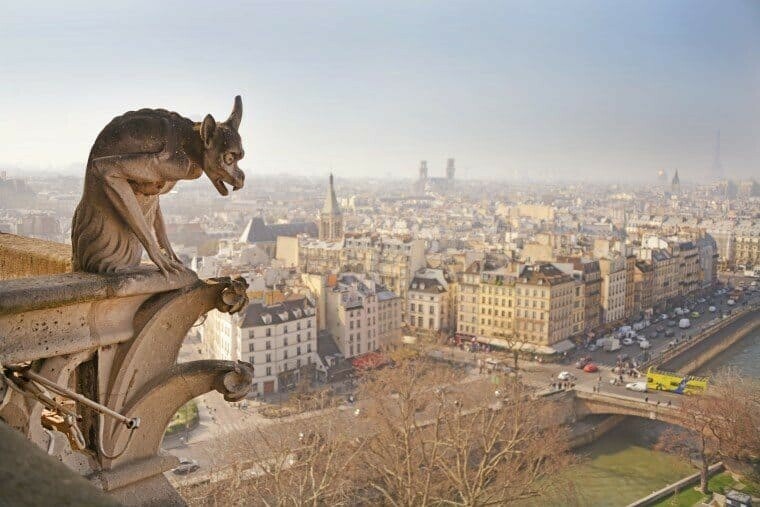 My favourite angle was looking down upon the Parisian rooftops where the Gargoyles sit, such a unique way to view the city! Be warned however it’s very popular and can feel a little rushed due to groups being ushered through to avoid congestion. Printemps Department Store. 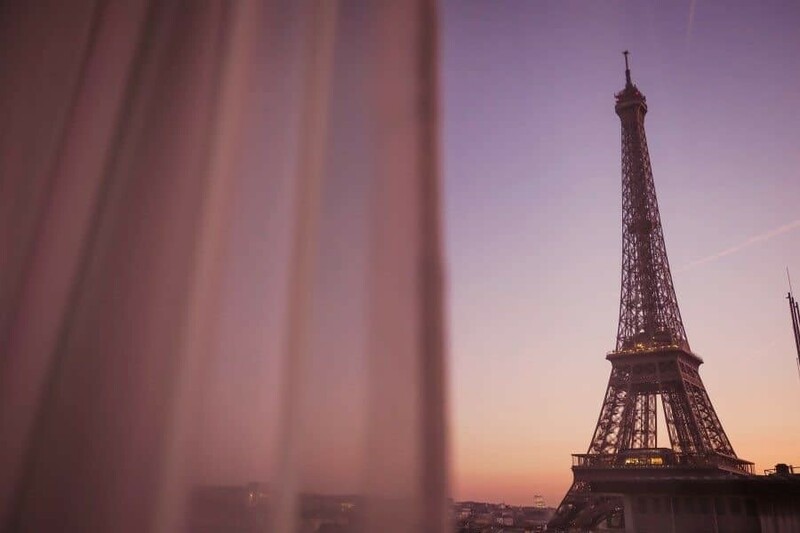 Catch the elevator up to the rooftop café and enjoy views over the Parisian roof tops with the Eiffel Tower standing tall behind them. Chaillot Hill and the Trocadéro. You definitely won’t be alone here but the view is hard to beat and you can use the Fontaine de Varsovie (Warsaw Fountain) as a great subject to compose your image against the Eiffel Tower. The banks of the Seine. 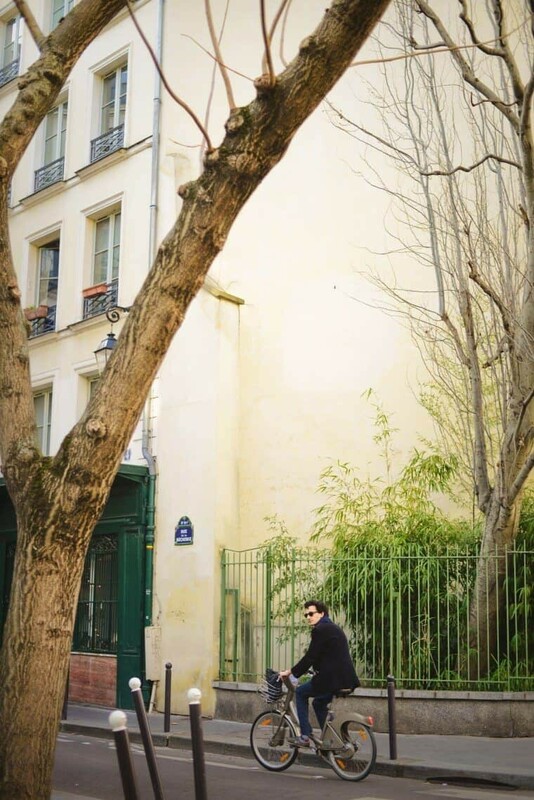 Stroll along the river banks to take some unique images of the Eiffel Tower framed with trees, as boats pass by or just a varied city scene from the norm. 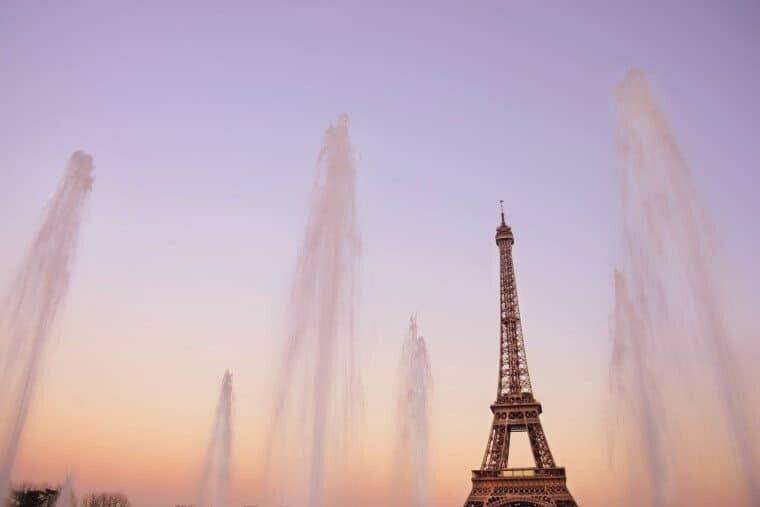 The Eiffel Tower framed by the Warsaw Fountains. 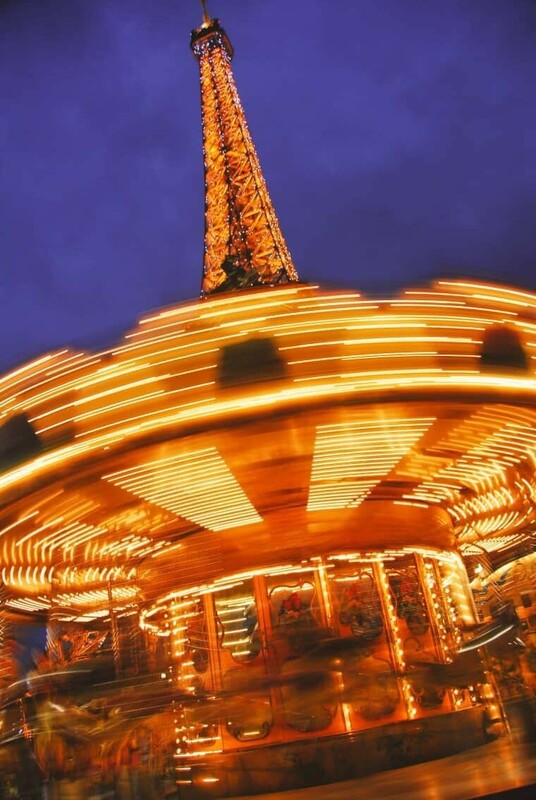 The Eiffel Tower peeking from behind the Carousel on the banks of the Seine River. As a central landmark in Paris, the Louvre was originally built as a fortress in the 12th century. Now the most visited museum in the world housing over 30,000 objects from history, you could spend all day here taking photos and that’s just the interior. 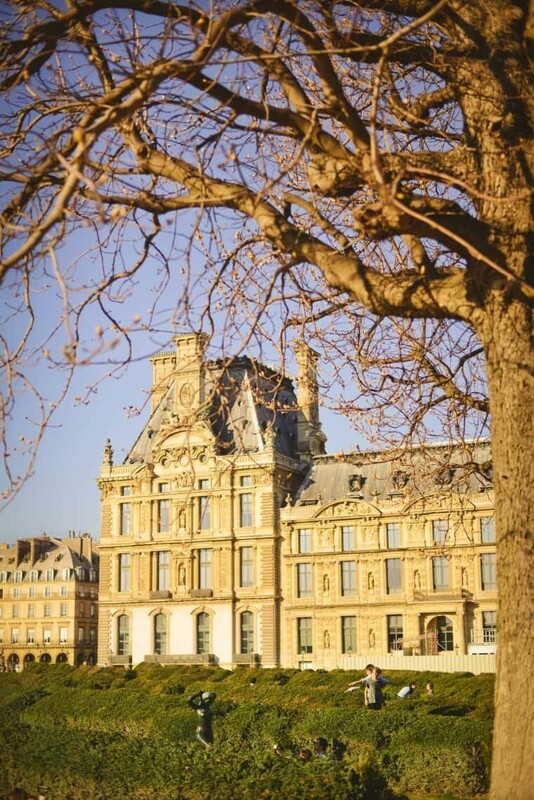 Outside are the perfectly landscaped spaces, The Carrousel Garden and The Tuileries. When the weather warms up you’ll find people sharing picnics and soaking up the sun in the gardens creating a great atmosphere! 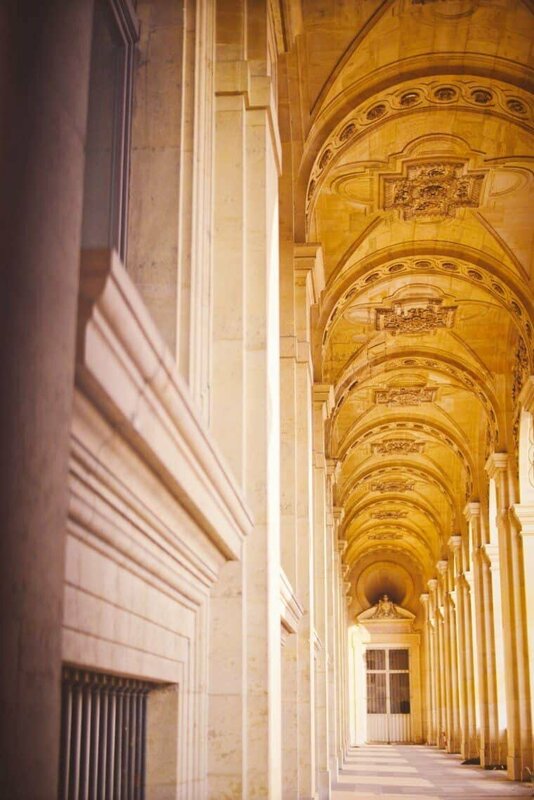 The Cour Carrée is another great photo location within the Louvre complex. 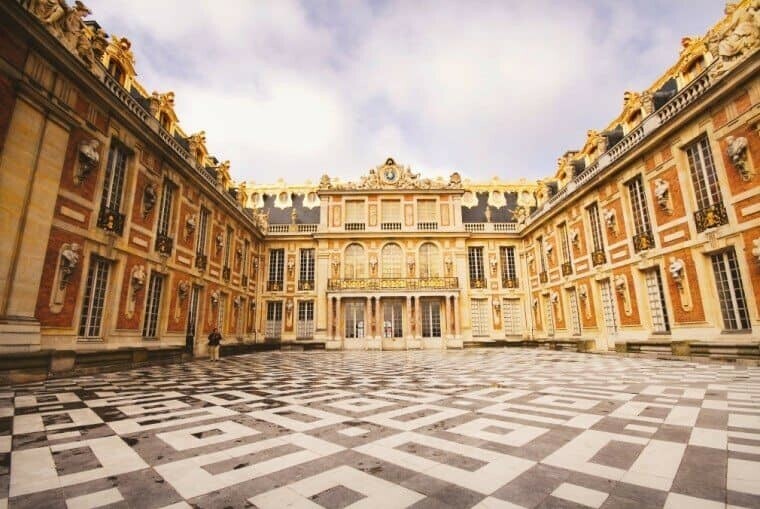 This square courtyard was completed by King Louis XIV as part of the ‘Old Louvre’ and is perfect for composing linear angles. A green oasis amongst the 6th arrondissement of Paris, the Jardin du Luxembourg is known for tree lined promenades and chestnut groves. The perfect place to set yourself up for the day to capture lifestyle images and have a picnic at the same time! 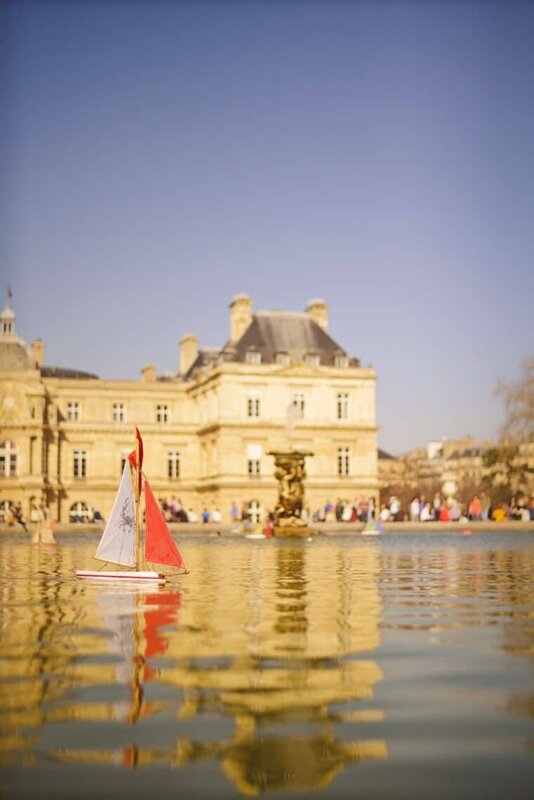 You’ll also find little sailing boats available for hire to float around in the fountain in front of the Palais du Luxembourg. 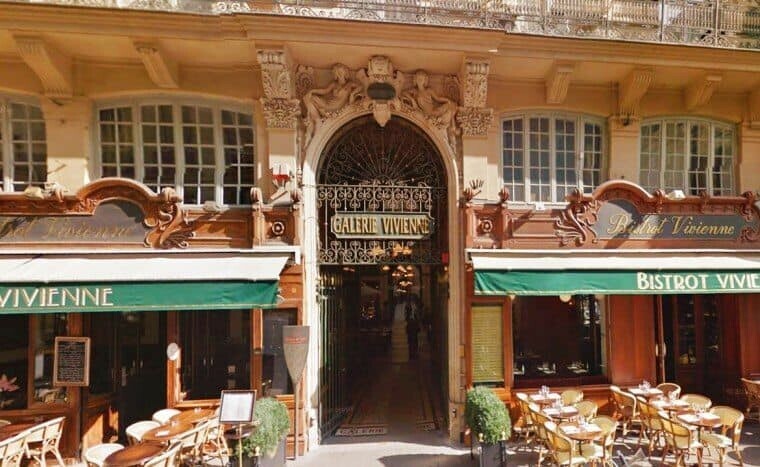 Fontaine Medicis is nestled in a little corner and is well worth a peek too. Perhaps the most famous street in the world, the Avenue des Champs-Élysées is bustling throughout the day with shoppers, tourists and locals visiting the stores and offices that reside here. The best time of day to photograph here would be in the evening once the stores have closed and the streets are a little emptier. 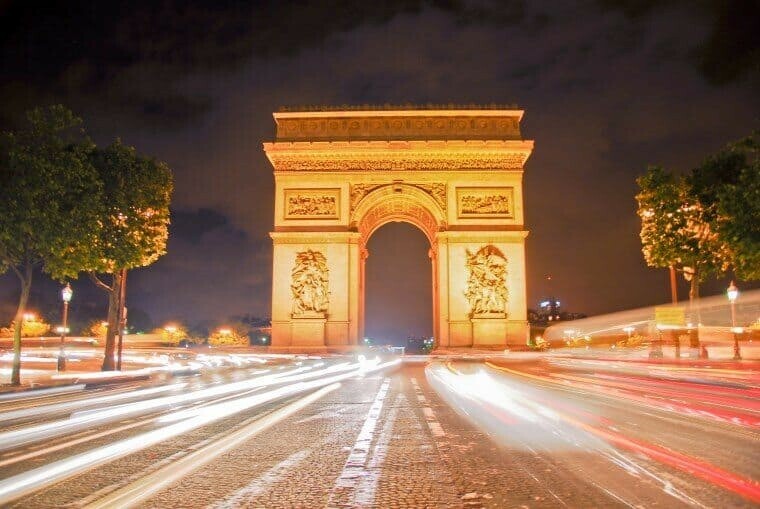 You’ll find the beautiful Arc de Triomphe sitting pretty at the top of the street waiting to be photographed as the traffic lights glow below. In the middle of the road are pedestrian islands so you can stop and take slow motion shots without worrying about being hit by a car! Underneath the streets of Paris you’ll find creative spaces and tunnels to photograph. 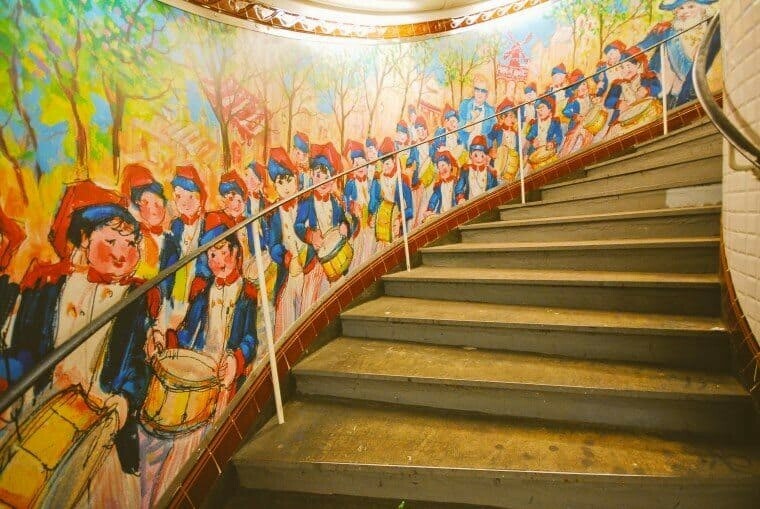 Of course not every metro station is picturesque but some are little gems of creativity with murals, themed designs and art nouveau entrances. If you feel like training it around the city take a peek at Arts et Métiers, Saint-Michel, Varenne (Rodin Museum), Concorde (designed as a giant word puzzle), Abbesses and Cité stations. 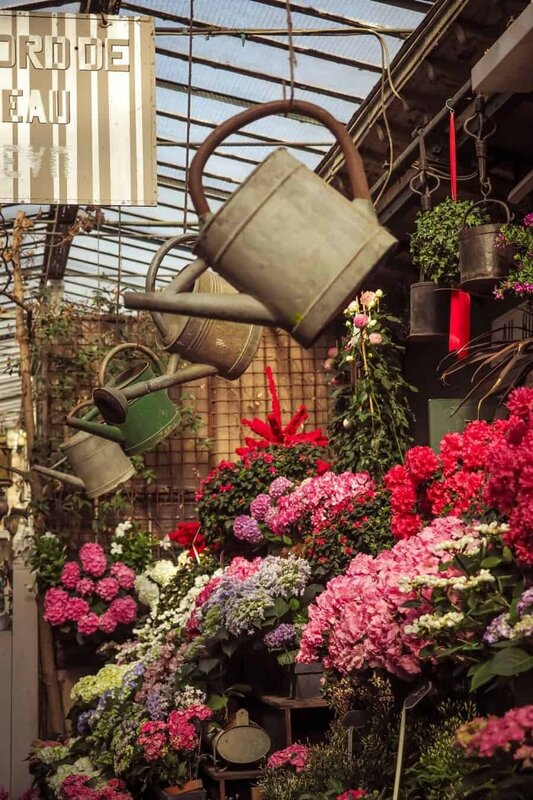 Nestled in a quiet square one block away from Notre Dame is the tranquil bird and flower market of Paris. 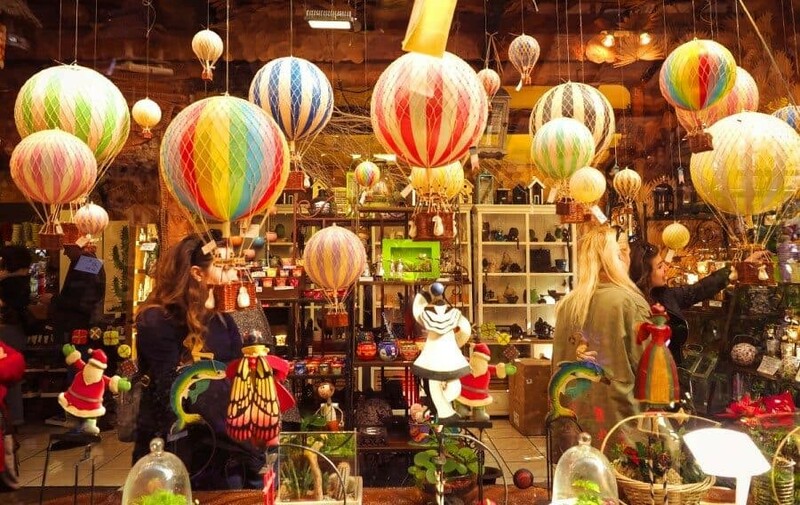 Here you’ll find chirping birdies of all varieties and so many blooming florals in carefully arranged bunches that it’s hard to believe you’re right in the centre of the city. 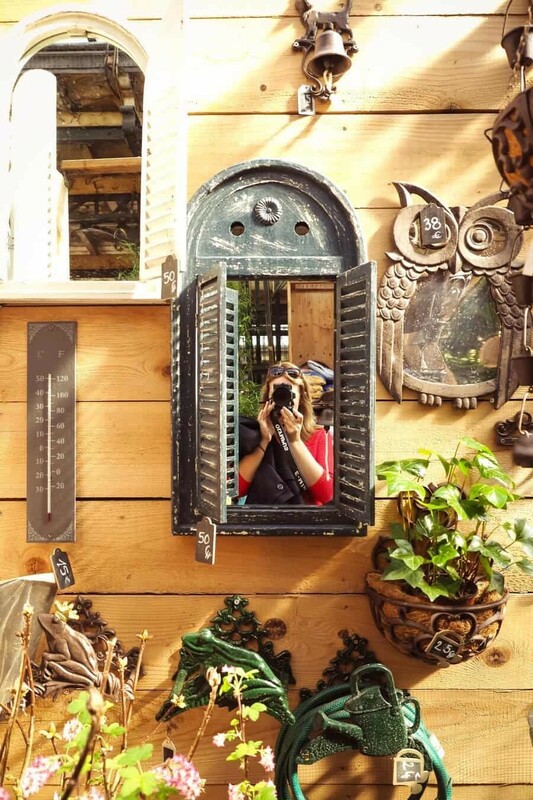 Little green market stalls link together to form a maze of all things gardening and decor, boy is it photogenic! Located on Boulevard Haussmann in the Opera district, this department store is a shopping dream! It’s also for photographers, visit for the impressive theatre-like design in the centre of the store, a dazzling bazaar! 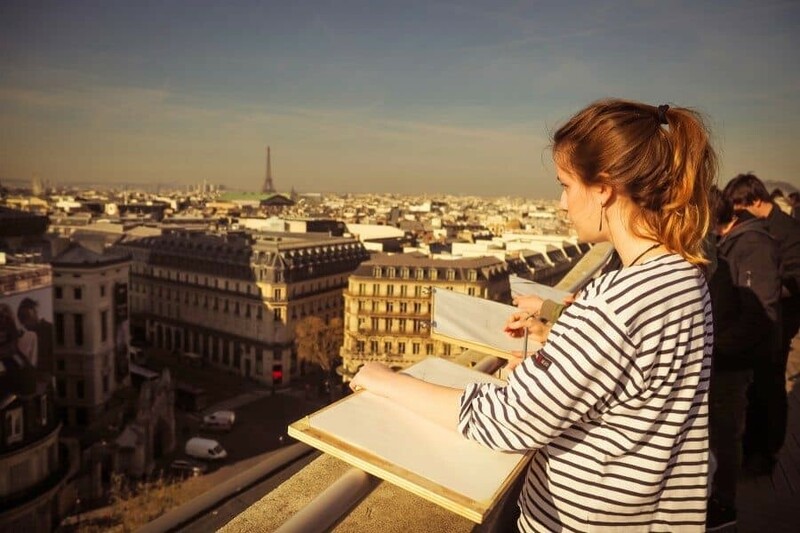 Take the stairs to the top level for views across the city, it’s outdoor panoramic deck offers an alternate view of the Eiffel Tower and you’ll be able to capture impressive shots above the Palais Garnier. Marché Mouffetard: A narrow street market described by Hemingway as ‘A Moveable Feast’. Colourful fresh food stalls and a vibrant atmosphere! Place de la Concorde: A main thoroughfare for tourist buses and pedestrians, this is a great place to sit on the stone walls and watch the world go by. Located at the end of the The Tuileries Garden not far from the Louvre, it’s a giant public square decorated with fountains. Side note…you’ll also find THE best public toilet in Paris here at the entrance to the garden. I’m not even joking, you’ll thank me later! 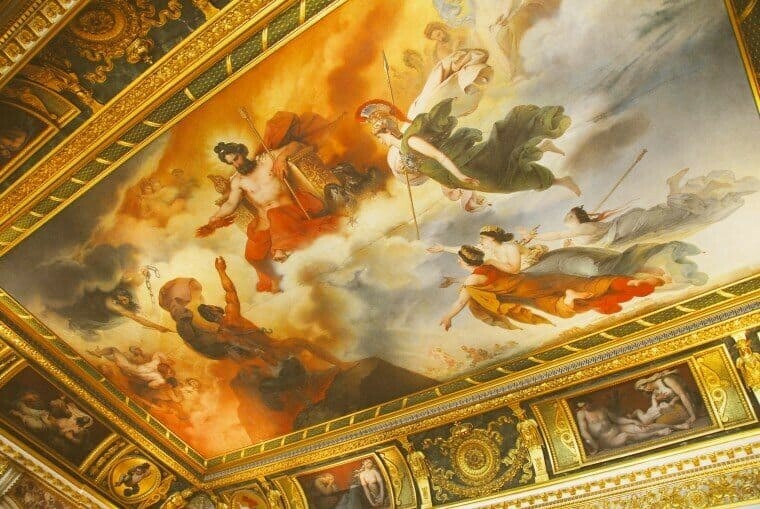 Palace of Versailles: A 40minute train journey out of the city will take you to the Palace of Versailles, an extravagant royal chateau. Have a peek inside here. Hotel de Ville: The town hall of Paris is home to the city’s administration offices however it’s exterior is far less boring. 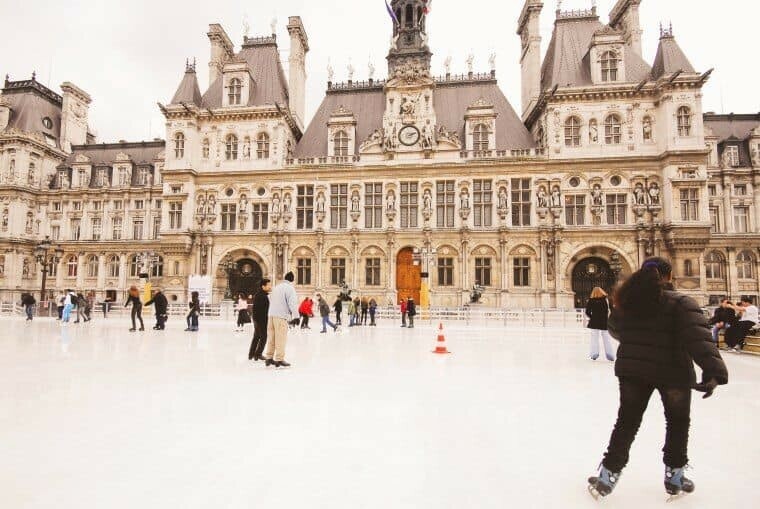 Looking more like a palace, the Hotel de Ville features a gorgeous Gothic roof and in winter it’s the backdrop to a giant ice skating rink…it looks beautiful lit up in the evening too! Rue Crémieux: A paved pedestrian street of colourful facades in the 12th arrondissement near the Gare de Lyon. Le Stade Roland Garros: Even if you’re not in town for the French Open in May, Roland Garros is a great day trip for tennis fans like me! You can get lucky and see a tournament or take a tour behind the scenes. 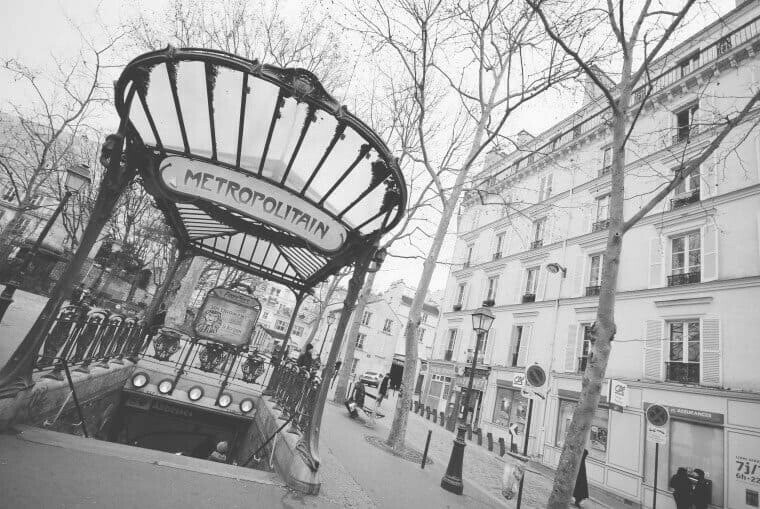 Catch the Metro to Porte d’Auteuil and wander the lovely area and parks too! St Etienne du Mont: An impressive Gothic church with unique details such as stone spiral staircases and giant stained glass window panels…light and airy. Galeries Vivienne: A hidden little arcade off Rue Des Petits Champs filled with character. 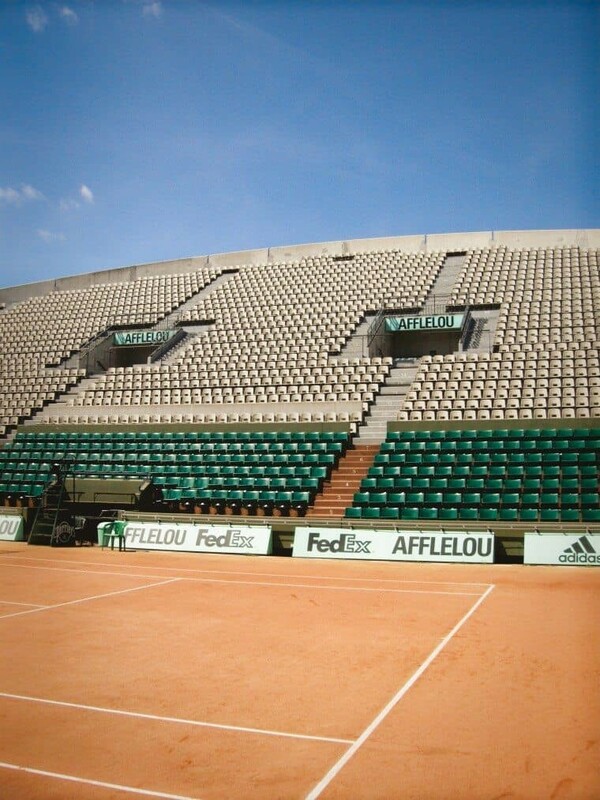 Roland Garros…tennis fans get yourself here! 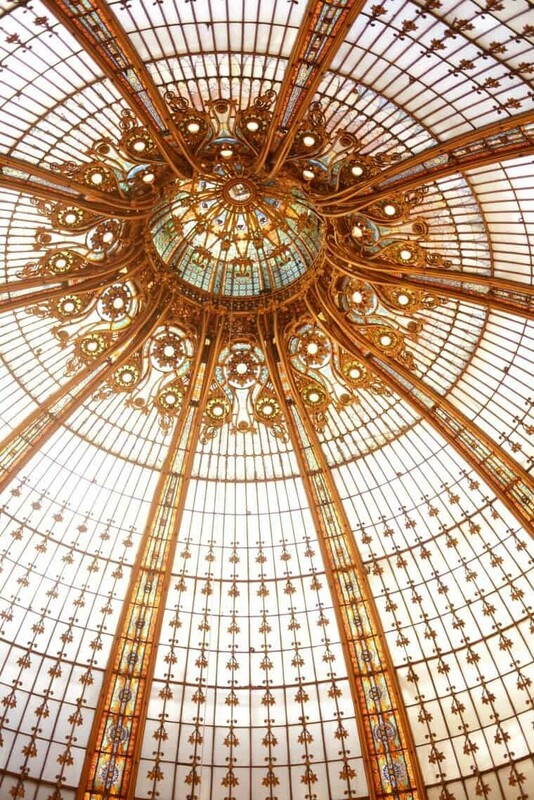 The ceiling of Galeries Lafayette in Paris. There are of course thousands of hotels, apartments and boutique properties to choose between when visiting Paris but for me, there’s one spot I love to stay when photographing Paris. Right near the Eiffel Tower. 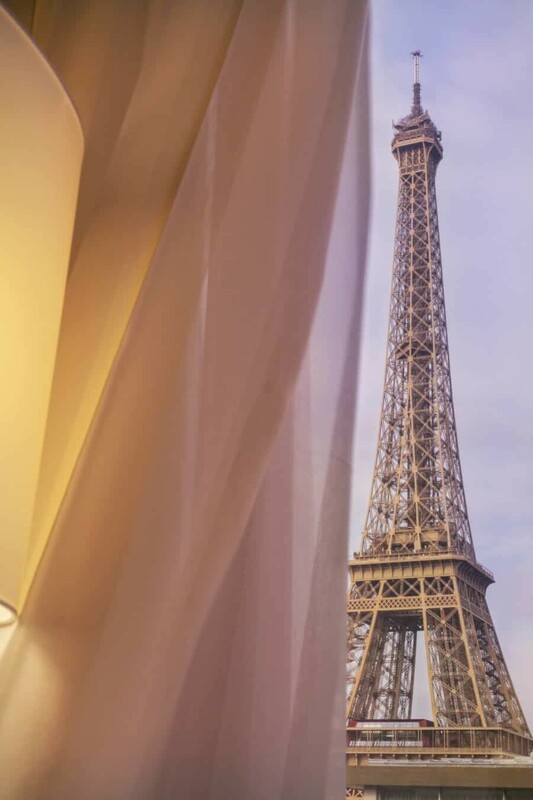 Not only because this iconic beauty is right outside the window, but because you’re close to the Seine and a short walk from some of the most beautiful areas in the city. 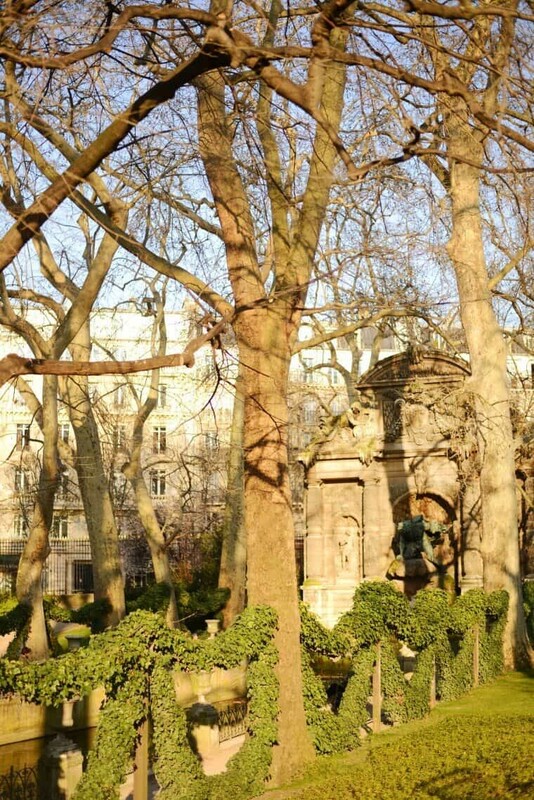 Start your walking tour in Saint-Michel then walk to all of the major sites of Paris, ending at the Luxembourg Gardens. This walk takes over 4hours without photo stops or going into museums etc, so I highly recommend breaking it up into a few days! If you are short on time, jump on the metro to zip between locations easily. Now if you’re more into catching the metro or choosing which locations you want to see, here is a map to all of the photography locations listed below in this guide. You should be able to click open this map and add your own locations, or create a customised walking tour. By clicking the ‘add directions’ button on the map it will bring up a Point A + Point B to work out directions for driving or public transport. Perspectives: 14 Places to Photograph the Eiffel Tower in Paris, a guide to all the photogenic vantage points to photograph the Eiffel Tower. 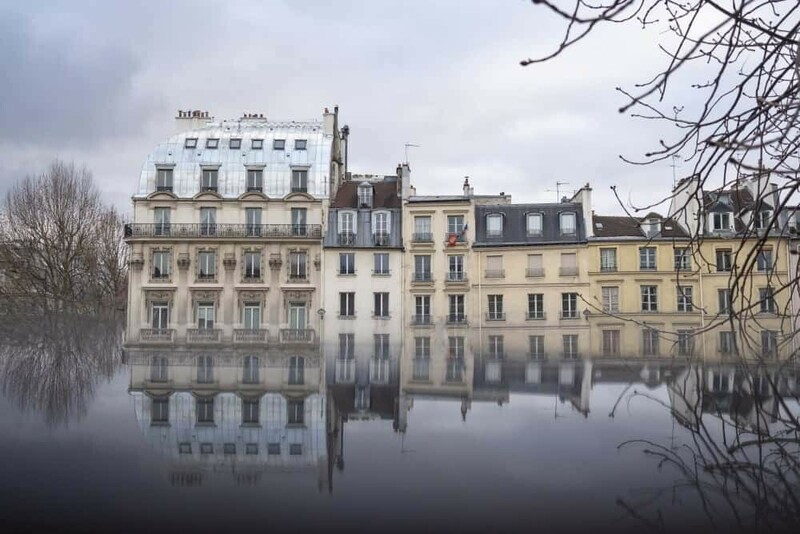 Setting the Scene: Photographing Le Marais quartier of Paris with a 50mm lens – creative tips and photography advice on street photographing in Paris. Want to take a peek inside the Palace of Versailles, browse this little photo guide to one of my favourite Paris photography locations! Heading South? Make sure you don’t miss out on the ‘Most Beautiful Villages in Provence, France‘ – a collection of medieval villages that are a dream to photograph! The Magic of Mont Saint Michel is evident from the moment you see it rising from the sand flats in the distance. A day trip to Mont Saint Michel from Paris is possible to take a peek or even better, aim to spend the night at one of the hotels in Mont Saint Michel for a historic and very special evening! 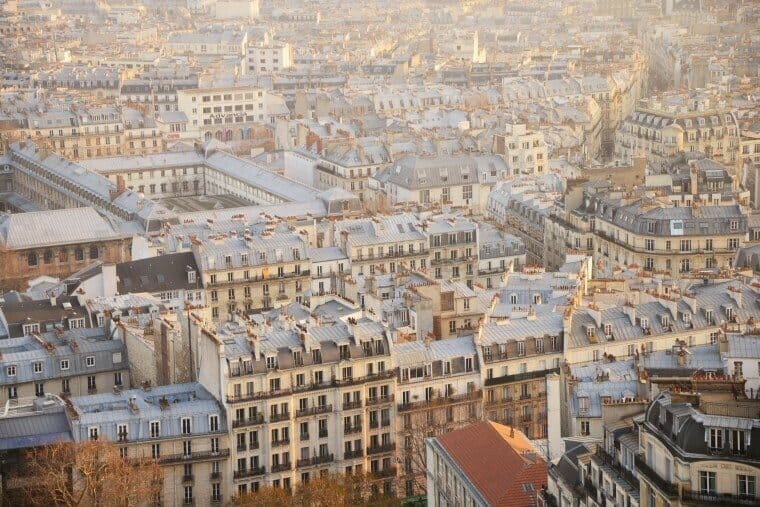 If you research correctly, one of the best Paris photography locations could very well be your hotel window. 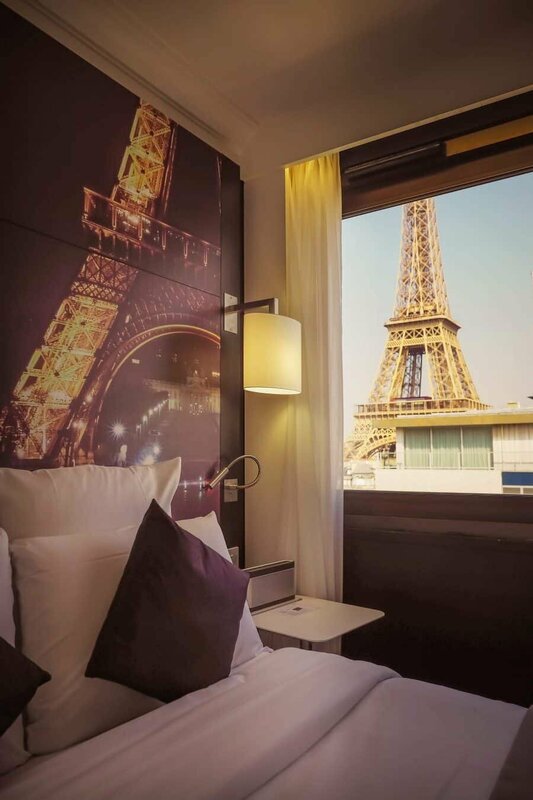 Take a peek at this article I wrote about shooting timelapse videos of the Eiffel Tower from my window at the Mercure Paris Central Eiffel Tower hotel. If you’re looking to escape the city and head for the hills, Briancon and the French Alps are waiting for you and your camera. I’ve written about photographing and hiking during summer in Briancon and also luxury and hiking in Saint-Veran, the highest village in Europe! 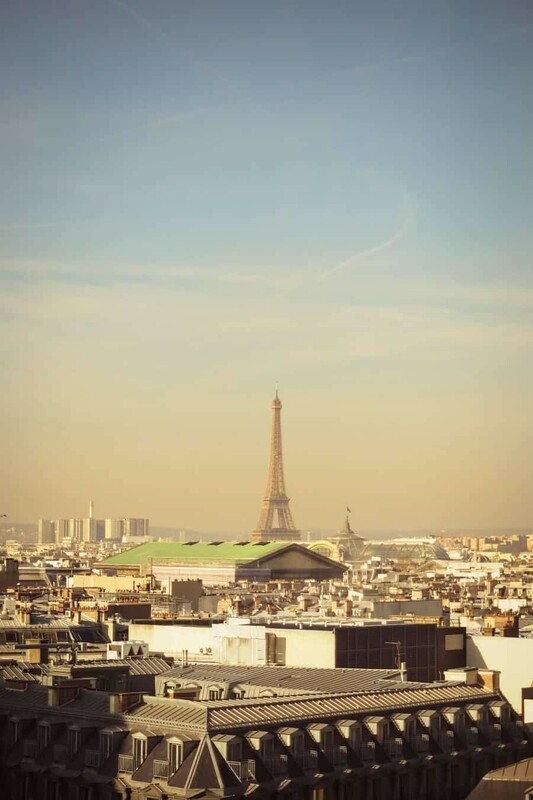 For all other articles relating to Paris and France, take a peek at my France Archives. 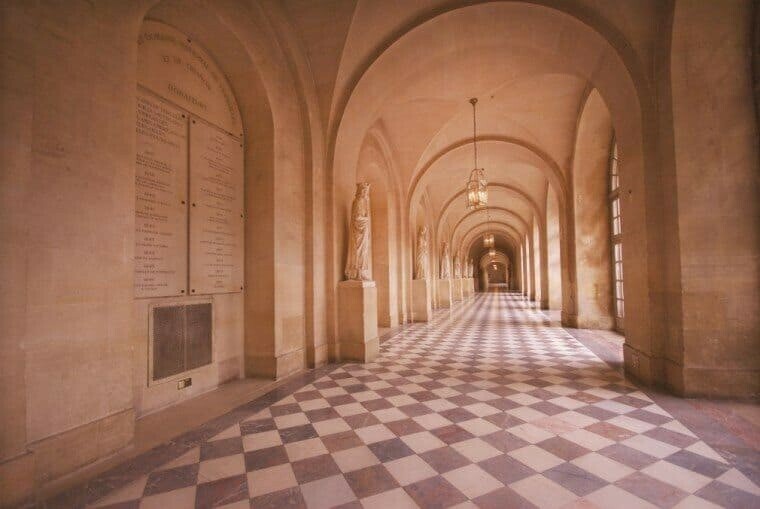 Want to share some of your secret Paris photography locations? If you’re willing, I’d love to hear about them in the comments below! If you’ve got a great photo from your Paris adventures to share use the hashtag #thewanderinglens on Instagram and you could be featured on The Wandering Lens. Love this post? 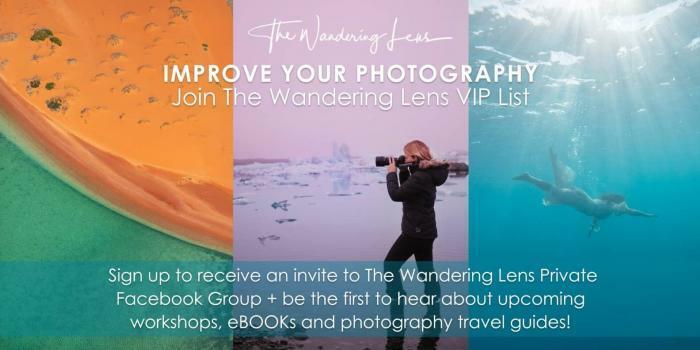 Pin the photo of your choice below on Pinterest and spread a little wanderlust! Oh my gosh! 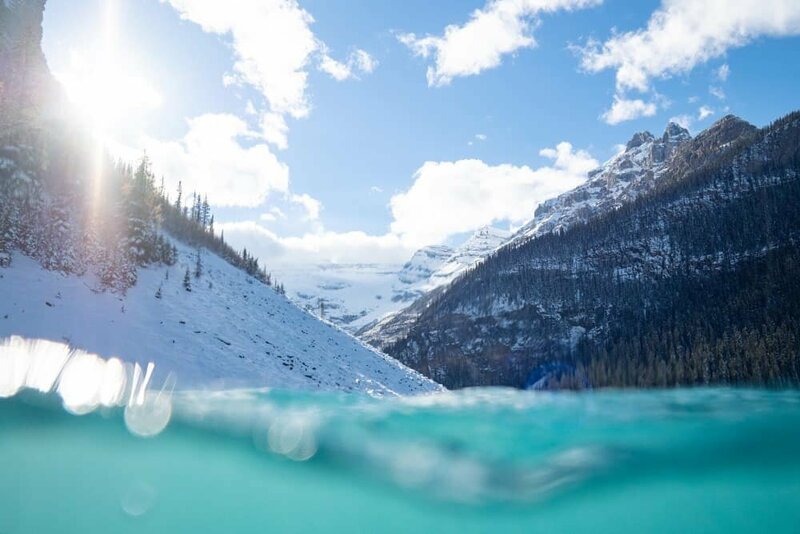 Your photographs are simply stunning! I’m so inspired. I will going to Paris next month and planning to shoot the Eiffel Tower from afar. The Basiliquedu ‘3oo stairs up’ like you mentioned seems like a very good vantage point. However, I’m a photographer who kinds of afraid of heights 🙂 When you mentioned narrow walkaway, does it mean the stairs are narrow from the beginning to the top or only from the dome area to the top? Is there any chance you can share this map via google? This is an excellant resource and would like to add some items to this. I have used your map during my vists to my office and would like to build on it. By far the most popular place to take photos of the Eiffel Tower is from Trocadero (on the lines 6 or 9). But beware that not all hours of the day or all spots here are good to take photos with the Eiffel Tower, because you will often get a lot of people in the background or even walking in front of your photos. Also, if you take photos just on the lookout platform, you will probably get a shot where the person is dark and the Eiffel Tower in the background is super bright. i love this post. Such a cool resource for my next trip to Paris. I love how warm your photos are! they make me SO nostalgic for Paris one of my favourite cities in the world. I’ve been a few times in the summer/winter, but never in Spring so that’s next on my list. I wouldn’t be able to resist those incredible blooms. Amazing post! Thanks so much Christina! 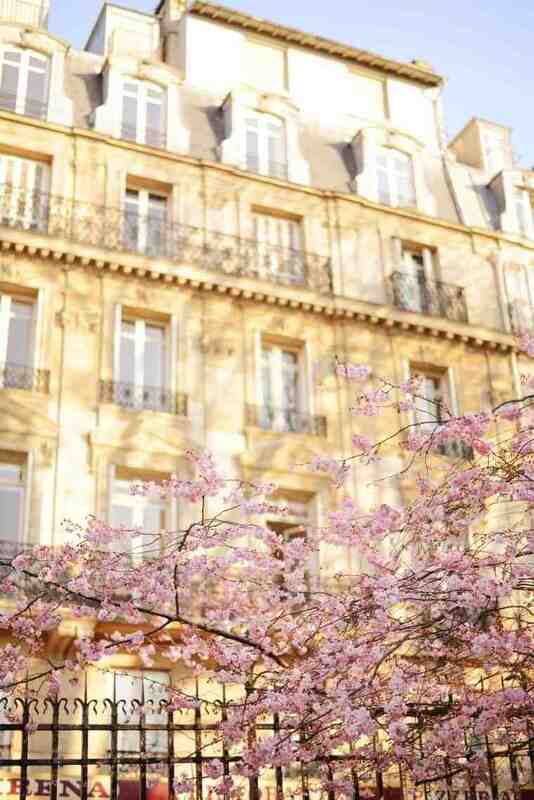 Spring is such a gorgeous time to visit Paris, even better if you’ve been before because you can dedicate all your time to simply wandering and chasing blossoms! Canal St Martin is in my opinion the most beautiful and photogenic part of Paris! There is a wonderful film that captures that beauty, it is called ‘Amelie’ (my daughter is named after her). I’m going to Paris soon and would like to download the “map: Paris Photo Walk” how do I do that? Photos are great! Thanks. Hi Marshall, if you’re reading the article on your phone you should be able to open the map and it switches to Google maps so it’s accessible for you. Excellent! Heading to London, Paris, Cologne and Zurich next months with my 4 kids. I’m mapping out walking trips. You had some points that weren’t on my map already. Thank you! So, I’m second guessing carrying around thousands of dollars worth of camera gear but I know I’ll be upset if I didn’t. What gear did you take? What precautions did you take? That’s so great to hear! I hope you have a wonderful trip 🙂 it’s a beautiful time of year to visit Europe! I always have my gear with me and it’s just a matter of being wary and keeping it close, I’ve never had any issues with theft. If you’re feeling a bit funny about it, wear your backpack on the front so it can’t be unzipped from behind. Also sometimes when I travel alone I carry a camera handbag, it’s big enough to fit my camera + lens but doesn’t look like it’s got expensive gear inside! awesome suggestion. thanks for the sharing. useful information. Hi, Lisa. I´ve been checking your blog and really liked your pictures. 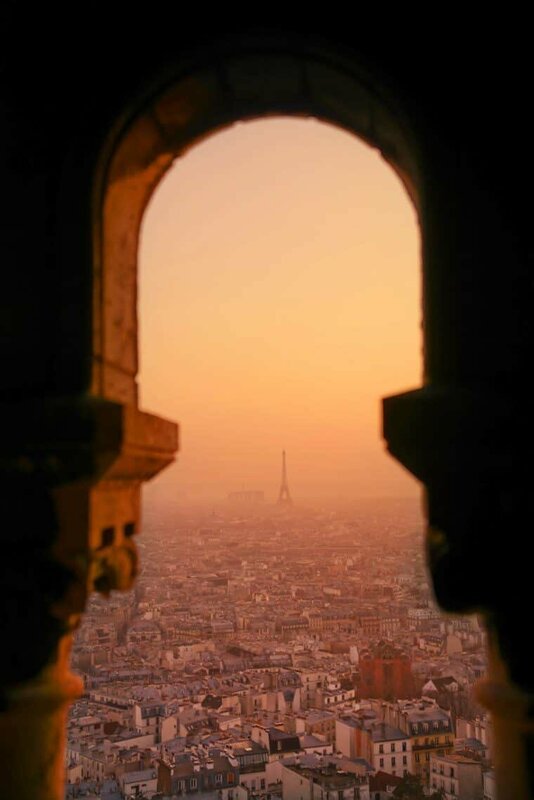 I was checking the ones from the Sacre Coeur Dome and wanted to ask you how did you get to take them. I looked at the opening hours during the whole year, and I can see it is never open at sunrise. Do you have to ask for special permission or any type of authorization? Thanks in advance! Hi Martin, lovely to hear you’ve been enjoying my website! The images captured from the top of the Sacre Coeur were taken at sunset and at certain times of the year you’ll find the opening hours actually coincide with sunset. It’s best to head up to the top about an hour or more before sunset to capture the golden hour (which is what you see in my images), the stairwell closes roughly 30minutes before closing but always check this beforehand as times do change regularly!